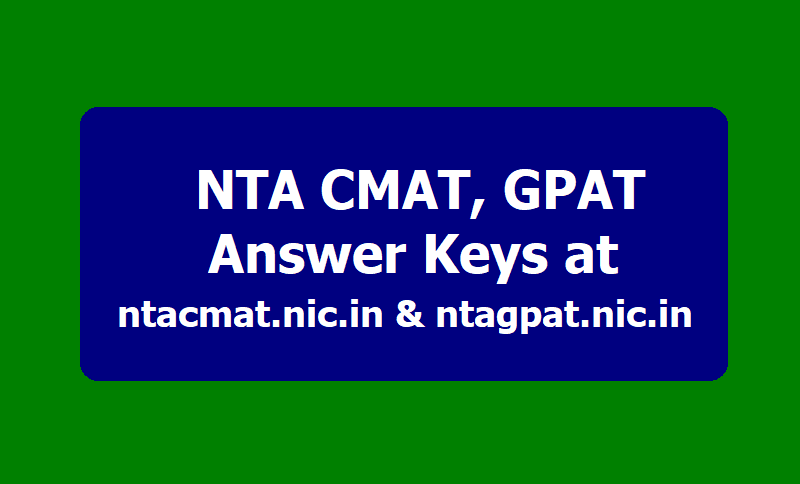 NTA CMAT, GPAT Answer Keys 2019 released, Raise Objections at ntacmat.nic.in, ntagpat.nic.in: National Testing Agency, NTA is expected to release the answer keys for the Common Management Admission Test, CMAT and Graduate Pharmacy Aptitude Test, GPAT soon on its official websites. Candidates who have appeared for the CMAT and GPAT examination can check the official site of NTA at ntacmat.nic.in and ntagpat.nic.in for details. The National Testing Agency (NTA) has released the Graduate Pharmacy Aptitude Test (GPAT) 2019 answer key. The examination was held on January 28. Candidates who appeared for the examination can check the GPAT 2019 answer key from the official website ntagpat.nic.in. They can also check their question paper and responses on the website. The GPAT 2019 examination was conducted in 84 Cities in 24 States/UTs for which 42,827 candidates were registered. The National Testing Agency (NTA) has released the Common Management Admission Test (CMAT) 2019 question paper and answer key on 01-02-2019. The examination was held on January 28 in two shifts. The Examination was held in 84 Cities in 25 States/UTs for which 64,582 candidates were registered. Candidates who had appeared for the examination, can check the CMAT answer from the official website ntacmat.nic.in. How to Check the GPAT, CMAT 2019 Question paper and Responses and Answer key? Step 1: Visit the official website for GPAT: ntagpat.nic.in and for CMAT: ntacmat.nic.in. Note: The result of GPAT 2019 will be declared by February 8, 2019. GPAT score will be accepted by around 800 participating pharmacy institutes. National Testing Agency, NTA has released the answer keys for the Common Management Admission Test, CMAT and Graduate Pharmacy Aptitude Test, GPAT today. The answer keys are available on the official site of NTA at ntacmat.nic.in & ntagpat.nic.in. Candidates who have appeared in the written examination conducted on January 28, 2019, can download the answer keys from the official site. Both the exams were conducted on the same day and a total of 64,582 registered candidates have appeared in the CMAT exam that was conducted at 183 centers in 84 cities while 42,827 registered candidates appeared for GPAT exam at 128 centers in 84 cities. Candidates can raise objections against the answer key for CMAT and GPAT from February 01 to February 03, 2019, 11 am. Candidates are required to pay Rs 1000/- online as the fee for each question challenged for both, CMAT and GPAT. The fee is refundable and will be refunded if the challenge is found correct. Candidates can download their answer key through the application number and password or through application number and date of birth for both CMAT and GPAT. Candidates can check more details from the official site of NTA at nta.ac.in. CMAT and GPAT examination was conducted on January 28, 2018 in the country. A total of 64,582 registered candidates appeared for CMAT exam at 183 centers in 84 cities while 42,827 registered candidates appeared for GPAT exam at 128 centers in 84 cities. The window to raise objection will also be opened for appeared candidates soon after the answer keys are released. Candidates who are not satisfied with the answer given in the answer key can raise objection against it. The processing fee is Rs 1000/ question through credit card/debit card/Net banking. The processing fee is non-refundable. Candidates can check the complete answer key, once it releases from the official site of NTA. For other details, candidates can visit the official site of NTA at nta.ac.in.